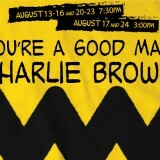 You’re a Good Man, Charlie Brown, but we know our loveable, famous, comic strip hero never catches a break. Touching the Charlie in all of us, this delightful musical performed by our Conservatory Education Students, takes us through an average day in the life of the Peanuts Gang. Scenes filled with Beethoven day, blankets, coat-hanger sculptures, dinner bowls and the mysterious Little Red-Haired Girl remind us to look inside for what makes us truly happy!